and other young artists who have no-school Fridays! watercolor, temperas, pastels, collage, mixed media, and more. Kid-priced snacks and open studio time are available too! Open to students 1st through 6th grade. Ongoing 4-week sessions. To register your child, just download the form below, complete, sign, and submit with your first payment. Drop-in guests are okay if space is available. A weekly art class for charter school students and other kids who have no-school Fridays. We'll focus on beautiful spring and Easter-themed subjects this session. If registering for a single class (not the entire session), please indicate during the payment process the child's name, age, and the date(s) for which you are registering. 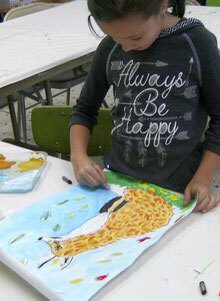 A weekly art class for charter school students and other students who have no-school Fridays. This session we'll create Spring-themed artwork especially for Mom (and more)! A weekly art class for charter school students and other students who have no-school Fridays. Our focus this Session will be on seasonal subjects and experiencing a variety of art media.